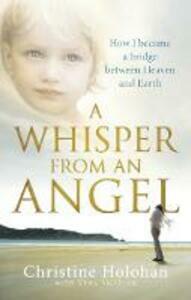 Christine Holohan saw angels around her bedside when she was a child. It was only when she grew up that she realised not everyone saw them. One night, when she was aged just 22, she began to have disturbing dreams of a young woman called Jacqui Poole. Jacqui had been murdered in the most shocking and brutal of ways. Christine approached the police and related what she could about the murder she had 'witnessed'. The amazing accuracy of Christine's description of the murder convinced the police, leading them to state for the first time that they fully believed in such a gift. But it took 20 years for science to catch up with Christine's testimony, at last giving the DNA evidence needed to convict the killer. A Whisper from an Angel is the remarkable true story of how Christine's extraordinary psychic gift finally brought peace to a young woman whose life was taken before her time.